« Nominate us for the 2011 Podcast Awards! Happy Monday, everyone! (Sighs and groans of protest emanate from the audience) Yeah, I know what you’re thinking: it’s a Monday, what can be good about that? 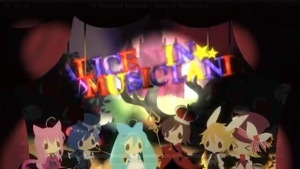 Well, I’ve found something that will put a smile on your face, especially if you’re a Vocaloid fan. Hell, I think you’ll get a kick out of it even if you aren’t into Vocaloids. So grab yourself a bottle of MORNING RESCUE!!!! and read on! I know, I know, a lot of you are probably yelling at your screens “Vocaloids AGAIN?? !” Vocaloid fever has certainly swept the world, and there are quite a few people who just Don’t Get It™. I know a few of my friends fall into this camp, same with certain podcasters out there. I think what a lot of these naysayers are getting hung up on is that they are thinking of Hatsune Miku & friends as replacements for human singers. After all, when you look at events such as Mikunopolis (which was AWESOME!!! by the way), us anime fans can’t help but draw parallels to those famous virtual idols of anime such as Eve from Megazone 23 and Sharon Apple from Macross Plus. Well, I think people who are thinking like this are missing the point. The way I see it, the Vocaloid characters are, to put it bluntly, window dressing. The real win here is the Vocaloid software itself, which, when you think about it, is an amazing technological achievement. And it’s the final component in the amateur song creator’s toolbox. Think about it. We now have computers on our desks (and in our backpacks and book bags) that are powerful enough to allow us to create music. High quality microphones are inexpensive and easy to set up, and with technologies such as MIDI, it’s easier than ever to bring music into the digital realm. But even if you’ve never touched an instrument in your life, you can still create great-sounding music thanks to “loop” and musical instrument synthesis software such as GarageBand, Reason, Acid, etc. But the one thing that’s been missing is the human voice. Because, let’s face it, not all of us have the best voice out there. (And only Bob Dylan has the chops to pull off the whole “singing with a less than perfect voice” schtick.) So yeah, you might be able to create an awesome song, but you weren’t able to give it a voice. (It’s not like you could call up Hikaru Utada or something and ask her to record your song for you.) But now that Vocaloid is out there, your musical toolbox is complete. And there’s quite a selection of voices to choose from, one to suit every mood — Hatsune Miku, Kagamine Len and Rin, MEIKO, KAITO, etc., not to mention their APPEND versions, etc., and more planned for the future. OSTER Project is one such person. She has a wide ranging body of work, both original and cover songs/arrangements, and has worked on non-Vocaloid projects as well, including themes for net games and other material meant for actual human singers. And she has recently released a truly amazing work. Taking songs from her fourth album Cinnamon Philosophy, and borrowing heavily from classic Disneyesque musicals, she released a truly amazing video, “Alice in Musicland,” that takes our favorite Vocaloids and mashes them up with Lewis Carroll’s classic “Alice in Wonderland.” The result: A truly amazing work that (IMHO) will appeal to even non-Vocaloid fans, because it appeals to one of our core ideals, the happiness and unity that music can bring to the world. Watch it on YouTube or via the embedded player below the cut.